A long time customer of ours was visiting one of their manufacturing facilities and discovered there was tremendous difficulty testing the finished product. The culprit was the mating and un-mating of FAKRA SMB connectors. Technicians were having a very hard time making the connection resulting in increased test time and poor tested product yield. By design FAKRA SMB connectors require a fair amount of force to mate. An individual not familiar with these connectors may erroneously believe the connectors are incompatible and unable to mate due to the force required to make the connection. As a little more force is applied the connection is completed with a distinct clicking noise. The snugness of these connectors is due in large part to the plastic housing surrounding the FAKRA SMB connector. The plastic housings are available in multiple mechanical and color codes to easily identify mates. Designed for the automotive industry these connectors have penetrated off-road construction, motorcycle, trucking and watercraft markets. FAKRA SMB connectors were developed to operate to 3 GHz with a minimum of 100 mating cycles. The design of these connectors makes them ideal for high vibration environments but less than ideal for high volume test applications. Having experienced BroadWave’s expertise of designing and manufacturing unique solutions for their test environments our long time customer suggested the test engineers at this facility consult with us for a solution. As it was explained to us the technicians were removing the plastic housing of the FAKRA SMB connectors on their test fixture altogether and sanding the outer diameter of the connector in an effort to make interconnect easier to achieve. Needless to say the engineers were concerned about the validity of the tests as well the life cycle of the test fixtures. They shipped us some samples of the standard interconnect as well as the technicians ingenious albeit ill-advised solution. The result was the design and development of model 412-491-315. This 50-Ohm adapter has FAKRA SMB male to SMA female connectors and operates up to 4 GHz. 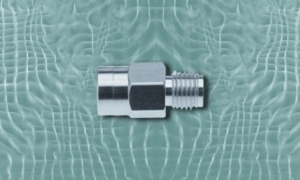 The FAKRA SMB connectors of these adapters are designed to mate effortlessly with FAKRA SMB connectors for a minimum of 200 mating cycles. The success of model 412-491-315 led to the design and development of its mate, model 412-492-320. This 50-Ohm adapter has FAKRA SMB female to SMA female connectors and operates up to 4 GHz. The FAKRA SMB connectors of these adapters are designed to mate effortlessly with FAKRA SMB connectors for a minimum of 200 mating cycles. Since the introduction of these adapters our customer has experienced a dramatic increase in their test yield. The customer also performed life testing of the mating cycles of the adapters concluding these adapters are extremely robust and exceed typical interconnect mating cycles. In addition to test environments we have seen applications for these adapters with first responders installing aftermarket antennas. These adapters are appropriate wherever interconnects from FAKRA SMB to SMA female are needed.